TrueWoW • How to Transfer Here! 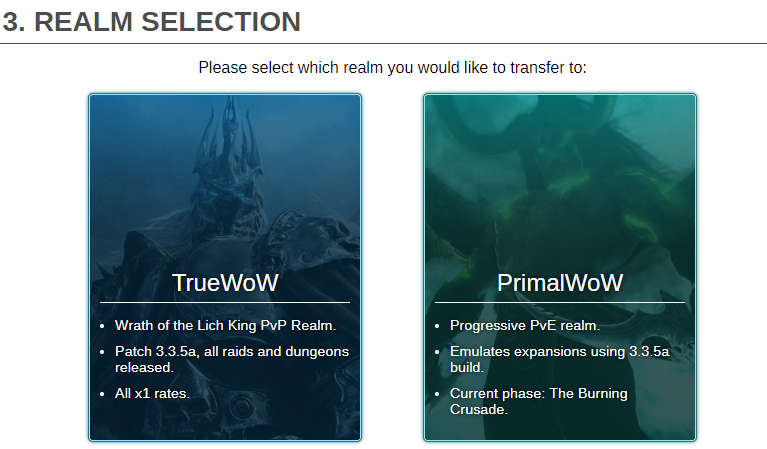 We have a system to transfer to TrueWoW or PrimalWoW from almost any private server which is still online, or from retail WoW. 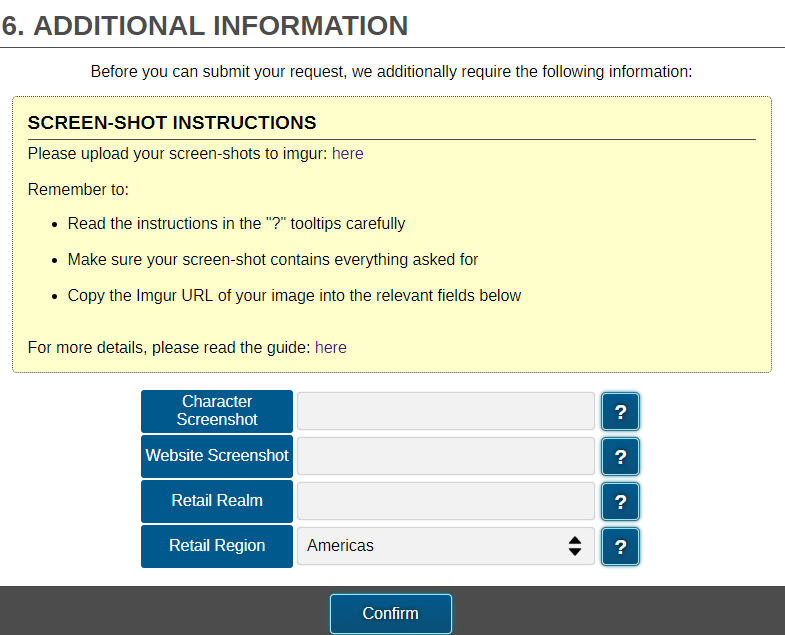 Follow these steps, as well as displayed instructions on the website, to successfully make a transfer application! 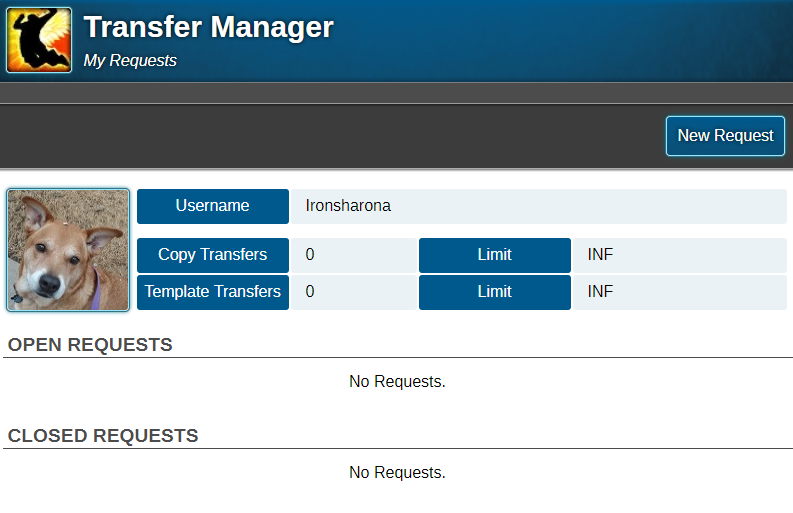 You can find the transfer manager here, under the Account tab on the website menu bar, or by typing www.truewow.org/transfer into your URL bar. Click on the New Request button to open a new application. If you have previously opened a transfer application, you should be able to see its status here as "Open" if it is pending or "Closed" if has been completed. The information on this screen was written directly by the transfer system designer, Nuko, so it's a good idea to review and understand what information will be needed from you in further steps. 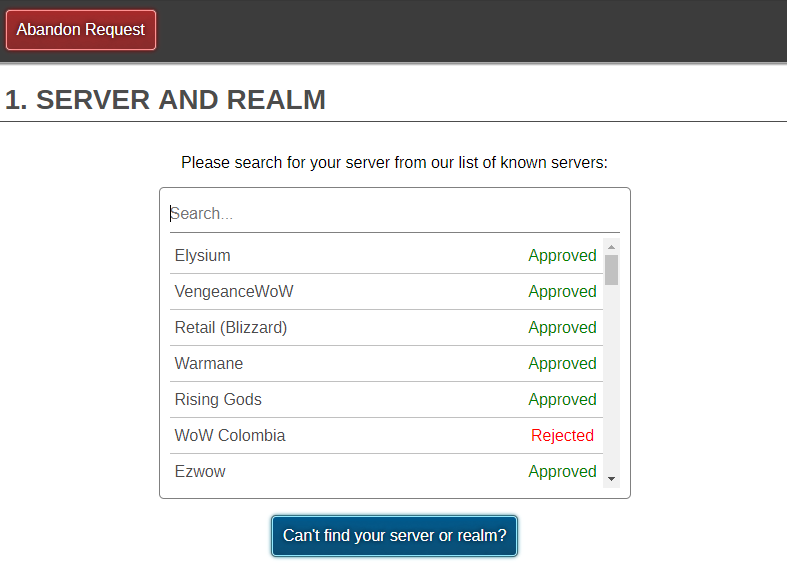 Scroll through the list of known servers, or type into the search bar, to look for your origin server. Once you find your server, you may also need to select the realm within that server that your character exists on. If you cannot find your server in the list, you can click the button below to tell us some basics about the server so we can add it to the transfer system. Notice that from here forward you can abandon your request at any time if you change your mind. 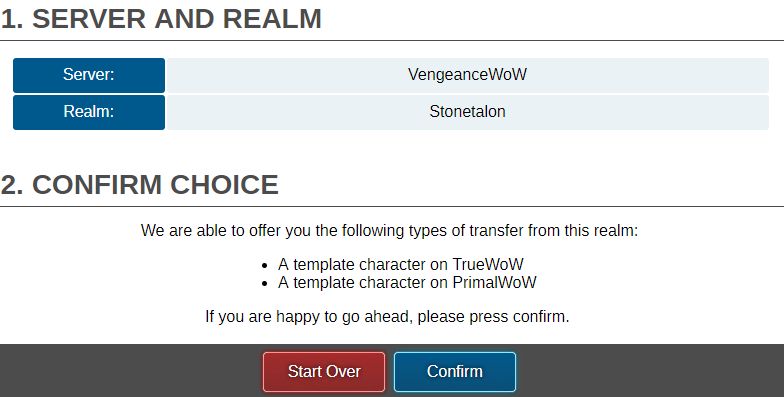 The type of transfer (Template/Copy) you could receive based on your server/realm selection will be visible so you can confirm you will get what you wanted, if approved. More details on these transfer types is available in Step 7. Click Confirm when you're ready. We have two realms. The namesake TrueWoW realm is a fully-released 3.3.5 Wrath PvP realm. The PrimalWoW realm is a progressive emulation of Vanilla through Wrath (currently in TBC) PvE realm, accessed via the 3.3.5 client. More details are visible in the image below. Click on the realm you want to join. Certain servers only permit a template style transfer. This means your exact character will NOT be copied, but you will receive a basic "starter" character of the desired faction, class, and specialization to get you going on our realms. In situations where a full character Copy is allowed, you may be able to bring your exact character with most associated armor, items, reputation, etc. 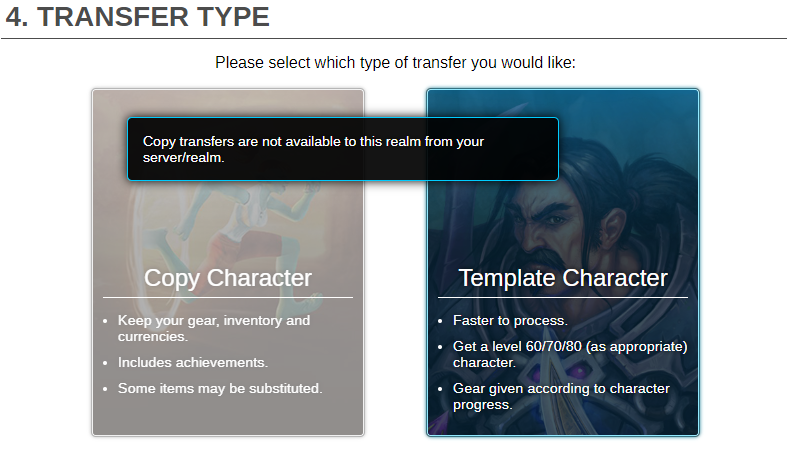 If a transfer type is grayed out, it may not be supported by the realm you selected in previous step. 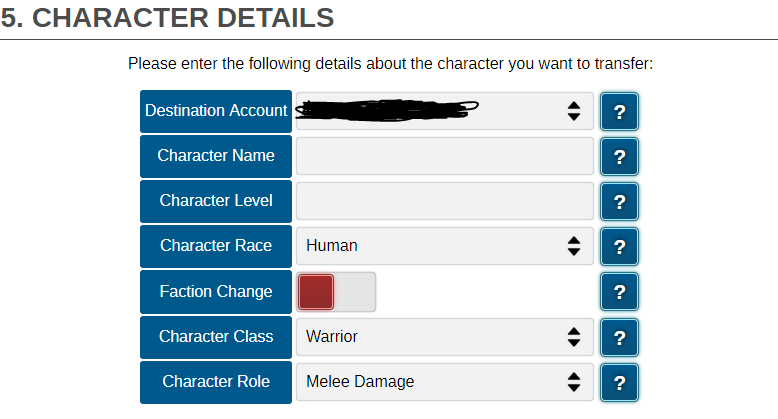 Some basic details about your character need to be listed so we can confirm the identity of your character. Required fields are shown below. The required information to enter will differ depending on whether you are requesting a Copy or Template transfer. It will typically involve login information if you are coming from another private server, or screenshots from retail (Blizzard). You've made a lot of choices and entered a lot of information! Make sure everything is correct one last time before submitting, to ensure a speedy transfer time. Once you're sure, hit either of the Submit buttons (at the top and bottom of the window). You should receive a notification via PM on the forums any time a GM updates your transfer application. You will receive updates when the application is approved or rejected, when a transferred character is available to play, or if a staff member needs feedback from you to complete the transfer. Don't forget you can check the status of your open/closed transfer applications from the Transfer Manager! 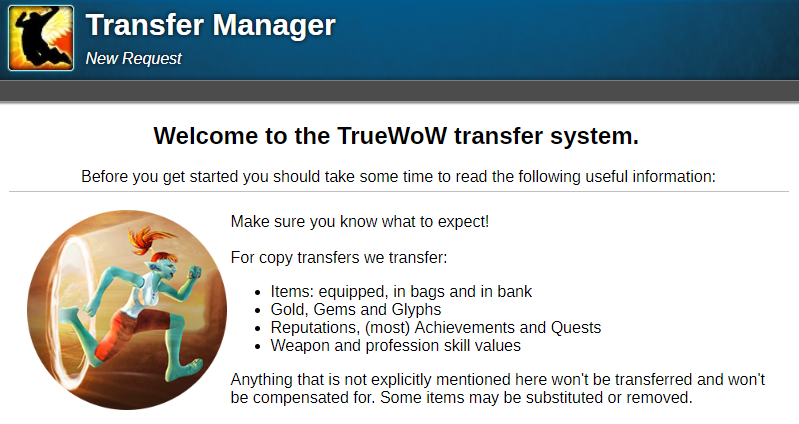 Thanks for taking the time to submit a transfer application, and welcome to TrueWoW! Please don't open tickets or threads asking when will your transfer be complete. Please don't open tickets or threads asking a Game Master to process your transfer. Please don't message the administrators asking for your transfer to be complete. Please be patient and wait until your transfer is processed. It only takes a couple of hours. Right now our staff is quite even but we are still more active at EU business hours, so the likehood that transfers are processed during that time is higher than at other times. If you do not receive any confirmation when submitting your transfer, that means your request was not received. You will always be notified when submitting your request. You will always be notified when your transfer is complete.